Daylight Saving doesn’t really bother me the way it bothers some folks. I have never paid much attention to it except when we get that extra hour in the fall. I kinda like that extra hour. But certain people get really bent out of shape over the revisited darkness in the mornings. I’ll let you in on a little secret… both Jeremy and I are really looking forward to setting our clocks ahead this Sunday. You know why? Neva still wakes up at 5:30 every morning. EVERY. MORNING. Lately, we’ve been leaving her crate door open and she sleeps through the night without a problem. I sleep on the right side of the bed, and because of my lymphedema in my left arm, I sleep on my right side. Like clockwork, Neva shoves her nose into my face at 5:31 am (presumably she takes a minute to get out of the crate, stretch her front half, stretch her back half, rub her left side against the bed, then rub her right side against the bed, and shake off). It scared the hell out of me the first time, but now it’s just really sweet except for the puke-thirty in the morning feeling when your REM sleep has been interrupted. I’ll feed her a couple of treats so her empty tummy doesn’t revolt, and then she jumps up onto the bed to snuggle between Jeremy and me… for all of ten seconds. Then she jumps down off the bed and trots around the room and jumps back on until Jeremy wakes up, dresses, and takes her out to potty. We are hoping after Sunday, that Neva will wake up at 6:30! Right!? I mean, it’s got to work for at least a few days, yes? Meanwhile, we are patiently waiting for the big snows that have yet to deliver this month. They said March would be snowy, but we’ve only gotten dribs and drabs interspersed with loads of warm weather. February was four whole weeks of freakish mother-loving sunshine. I feel as if I wouldn’t know what to do if we DID get a big dump powder day. Actually, I would totally know what to do – I’d SEND IT. 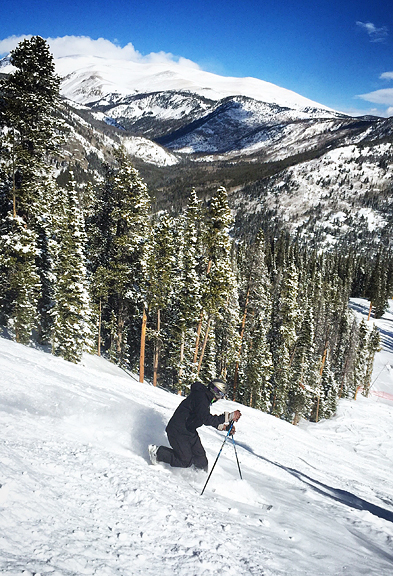 It’s clear that winter skiing is fast becoming a faded memory. The sun is getting higher in the sky each day and the snowpack is feeling it. When we pack up for a backcountry ski, we dig around for lightweight gloves instead of super warm gauntlets. And during my weekly menu planning, I’m thinking more and more about summer barbecues, summer fruits, and well – summer foraging. But let’s talk about barbecue. I’ve always been a fan of barbecue and the assortment of sides that come with it: baked beans, coleslaw, macaroni salad, potato salad, cornbread, rolls, mac and cheese, the list goes on. Last year I was getting barbecue at a roadside stand when I saw “sweet roll” as a side option. When I asked what it was the guy said, “It’s a sweet potato roll.” I couldn’t figure out if he meant it was a potato roll that was sweet or if it was a roll made with sweet potato or what. 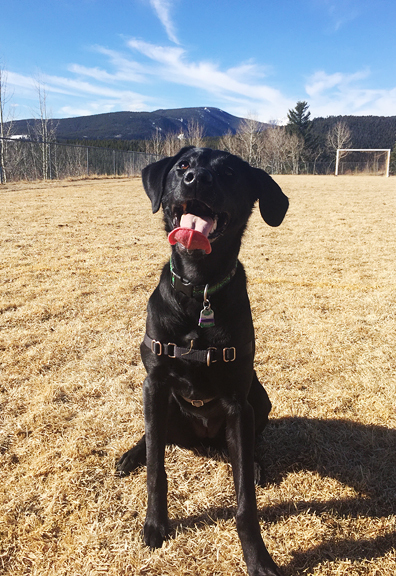 I bit, and it was – nice. So I set out to make some myself, because homemade is almost guaranteed to be better. 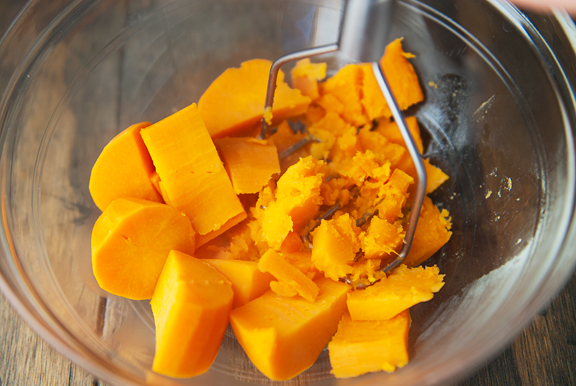 I’m not sure if there is a difference between using an orange-flesh sweet potato or a yellow-flesh sweet potato. I’ve read claims that the orange ones are sweeter and creamier, and I’ve also read just the opposite. I happened to grab an orange-flesh sweet potato, and I think if you use canned sweet potatoes (sometimes called yams, but not real yams at all) that you are also getting the orange-flesh variety. 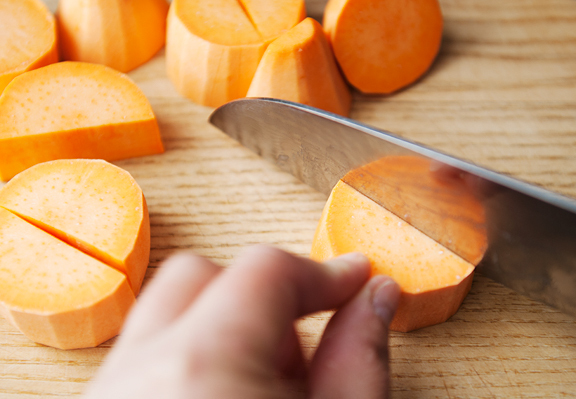 If you cook your sweet potato, you can roast or boil it – just be sure that it is cooked until very soft so you don’t have chunks of sweet potato rolling about in your dough. 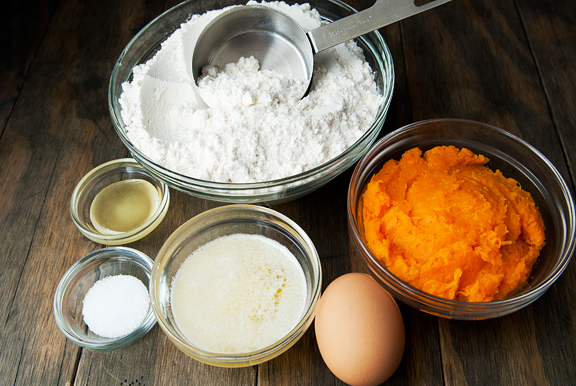 Once you have your yeast starter going, add the salt, honey, melted butter, mashed sweet potato, egg, and some of the flour. Some of the flour is about two and a half cups of flour. Since so many factors can affect how moist your dough is, it’s best to add more flour as needed rather than have a dough that is too dry. 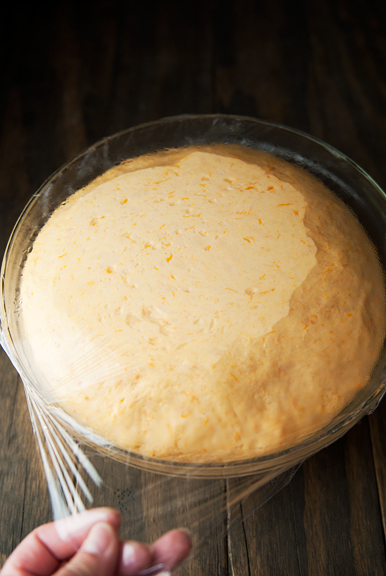 It will be sticky at first, but with a little more flour kneaded into the dough, it will eventually pull away from the sides of the mixing bowl. The texture we are after is slightly sticky and soft. 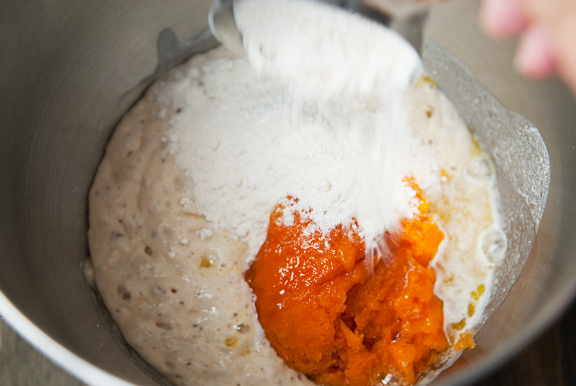 Once the dough is ready, form it into a ball and set it in a lightly-oiled large bowl. 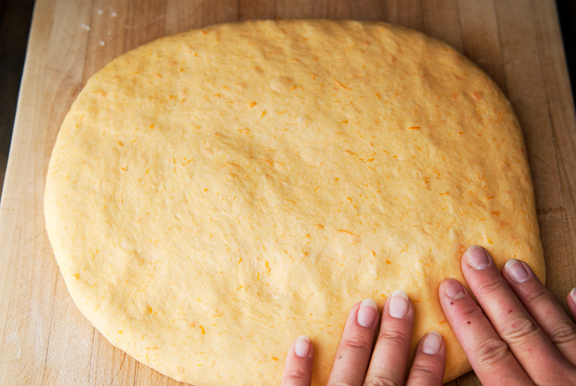 Give the dough a turn or two to coat the whole thing in oil. We want a large bowl because the dough is going to rise. We want a lightly-oiled bowl because it’s supposed to make it easier to release the dough from the bowl. Cover the dough and set it someplace warm for a couple of hours or until the dough has doubled in volume. Turn the dough out onto a lightly-floured surface and press it into a rectangular shape, or as close to a rectangle as you can get. 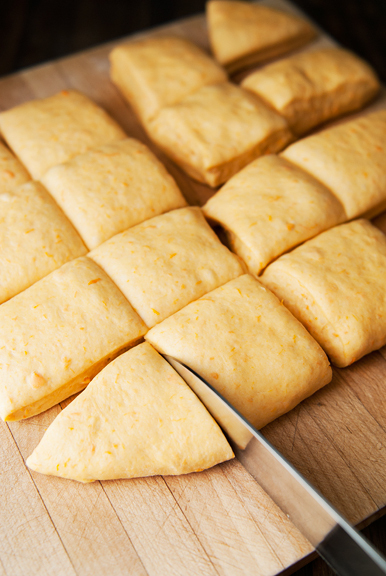 Depending on the type of buns or rolls you want to make, cut the dough into 8, 16, or 32 pieces. 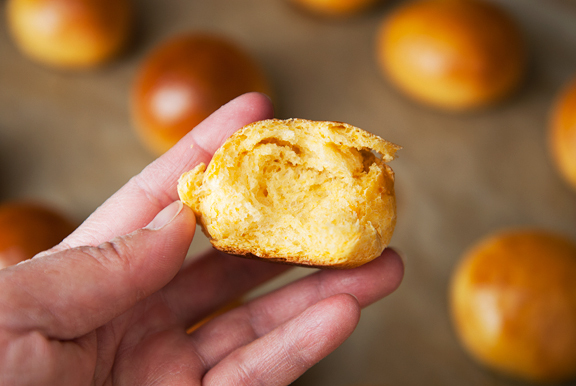 The smallest size yields buns about 2-inches in diameter. Shape each piece of dough into a ball. For best results (this is a great tip from Chef John), pull the sides down to the bottom until the dough is mostly round. 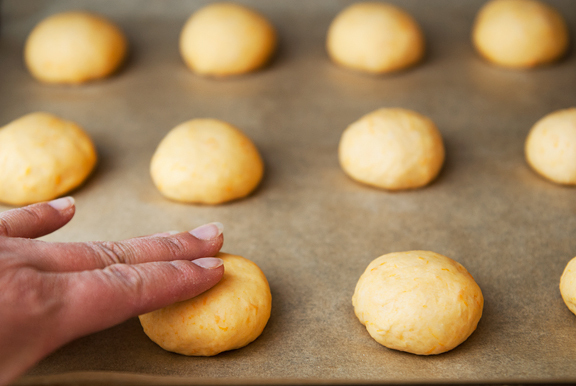 Then set the dough on your work surface, cup your hand around it like a loose-fitting cage, and quickly move your hand in a small circle several times allowing the dough ball to roll about until smooth and round. Set the dough on a baking sheet and give it a pat to flatten it (don’t flatten after the rise, you have to flatten before the rise). 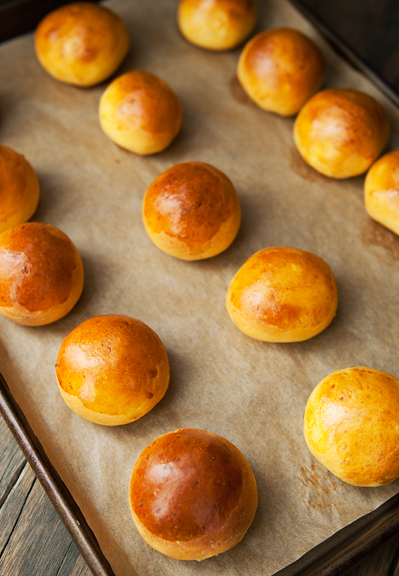 Let the buns rise, then give them a brush of egg wash on top and bake until golden. The larger your bun, the more time it will need to bake. These sweet potato buns have such a pleasing hint of sweetness that works with any savory filling – pulled pork, beef patties, barbecue chicken. Soft, tender, and airy, they surpass any buns I could buy in a store. And I rather like the orange tint of the bread. 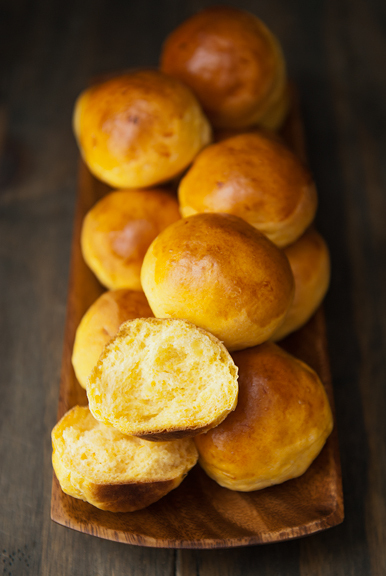 Eat them solo or pair the buns with something more substantial, but sweet potato rolls/buns are definitely worth making. Stir the yeast, the warm water, and 1/2 cup of the flour together in the bowl of a stand mixer and let sit for 15 minutes. The mixture should be foamy with some bubble holes in the top. 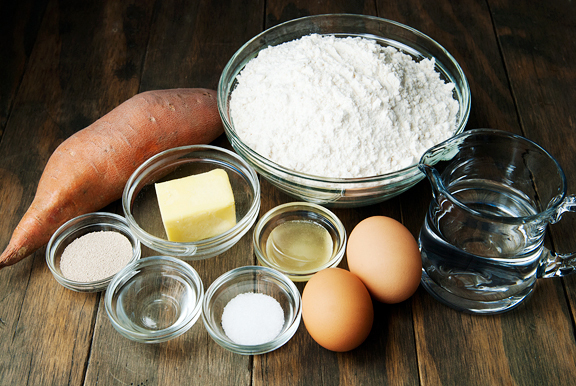 Add the sweet potato, honey, salt, egg, melted butter, and 2 1/2 cups of the flour to the yeast mixture. Knead on medium speed with a dough hook until the dough is just mixed. 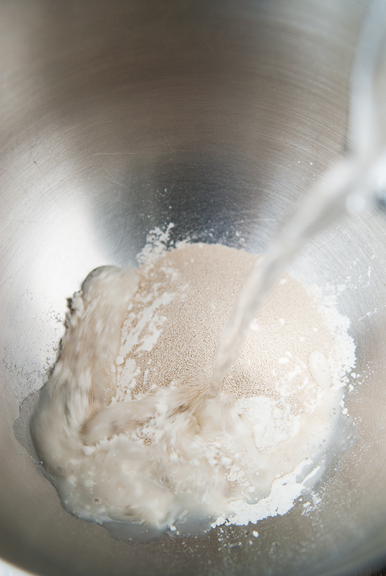 Add more flour as necessary and knead with the dough hook until the dough pulls away from the sides of the bowl. The dough should be soft and slightly sticky at this point. 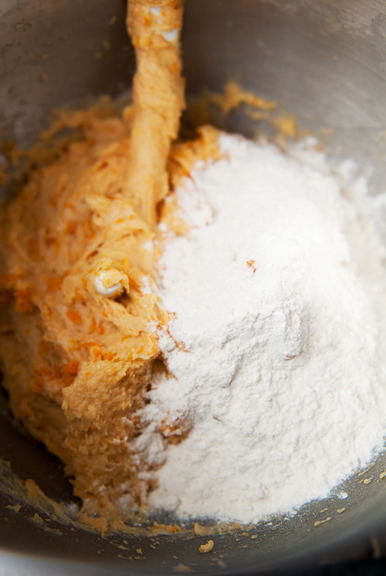 Remove the dough from the mixer and form it into a ball. 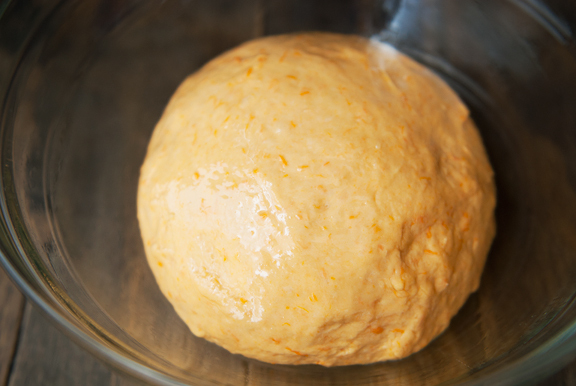 Place the dough in a lightly oiled large bowl, turning the ball over to coat the entire thing. Cover with plastic wrap and put the bowl in a warm, draft-free location. 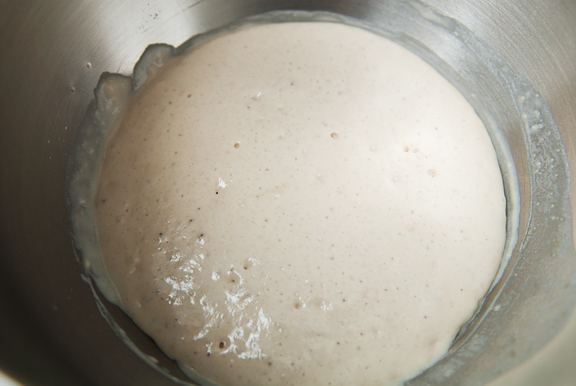 Let the dough rise for 2 hours or until it has doubled in volume. Line 2 baking sheets with parchment paper. Turn the dough out onto a lightly floured work surface. Punch the dough down into a rectangular shape. 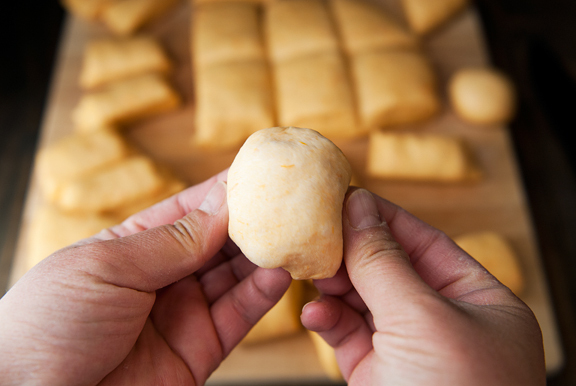 Cut the dough into eighths (for large buns), sixteenths (for medium buns), or thirty-seconds (for sliders or small rolls), taking care to keep the pieces as similar in size as possible. For each piece of dough, shape it into a ball by pulling the edges down and under, then set it on the work surface with your hand gently cupped over the dough. Roll it into a smooth ball by moving your hand in a circle on the work surface quickly and several times while the dough spins about inside your palm and on the work surface. 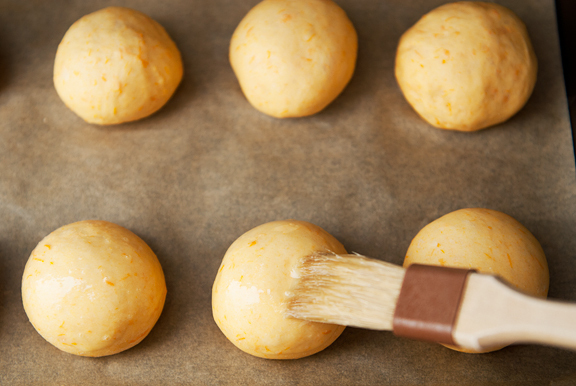 Set the dough ball on the baking sheet and gently press down to flatten the ball. Place the dough balls an inch apart. Cover the buns with plastic wrap and allow to rise for 45 minutes until doubled in size. Preheat oven to 400°F. 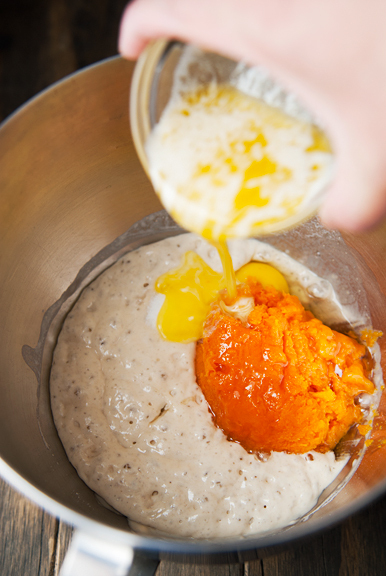 Mix the egg and water together to make the egg wash. Brush the tops of the buns with egg wash. Bake the buns for 12-17 minutes or until they are golden on top. Slider buns will bake the fastest (around 12 minutes) and more time will be needed for the larger sizes – about 15 minutes for medium buns and maybe 17 minutes for large buns. Remove from oven and let cool. Makes 8 large buns, 16 medium buns, or 32 slider buns. Once completely cooled, you can keep them in an airtight container for up to a week. Reheat in a 350°F oven for a few minutes until warmed. Those are beautiful, and I just happen to have a bag of sweet potatoes from Costco that need to be used up! I will be roasting some with other veg & trying a miso vinaigrette with them, but I am sure there will be enough left for rolls. Thanks! I just made bun dough yesterday, I wish I had seen this first! I love this idea. And what a beautiful color. Meanwhile, we’re patiently waiting for the big snows that haven’t been delivered this winter. lol. Ready for Spring, sugaring has started, and any snow at this point, a little too little, and a lot too late. It is what it is, I suppose, and it’s all good, right? We are expecting snow on Monday so that should be the perfect day to make these rolls! I hope you get to ummm…sleep in an hour later on Monday? I made your recipe and stuffed it with burger patties and a dash of sriracha. So delicious! Thank you for sharing. Thank you for your candor about cancer. Yours was the first place I came to when I learnt I had breast cancer last year. I’ve completed treatment now, it was thankfully caught early enough that it hadn’t spread to the lymph nodes. But when I was in the midst of it and my emotions were all over the place, I came very often to your blog. Your words and attitude were uplifting and made me feel hopeful. Thank you for that. Kristin – I think you need one, maybe two if they are small, for this recipe. Hope you get to try the recipe, these are delicious! SAJ - it really is a striking color, and all natural! Rach's Recipes - you're welcome!